Dr. Noureddine Melikechi, Professor of Physics, Dean of the College of Mathematics Natural Sciences and Technology at Delaware State University (DSU) and the founding director of the first Applied Optics Center of Delaware at the same university, speaks to Inspire Magazine about his involvement with NASA’s Curiosity Rover Mars mission, his research and thoughts on science strategy, innovation and culture. Inspire Magazine: Dr. Melikechi, thank you very much for taking the time to speak with Inspire Magazine and address its readers. Can we start this interview by asking you to tell us about your scientific journey and how it led you to the Delaware State University? Noureddine Melikechi: Please allow me to start by congratulating you for taking a wonderful and exciting initiative: the launch of Inspire Magazine. I wish the Magazine much success and as its name indicates I look forward to the days when hundreds and possibly thousands of our young minds are inspired by it. As for my professional journey, it is to some extent not different from that of many of our fellow Algerian scientists and engineers and to some extent others who may have chosen to be in other fields. After three wonderful years of high school studies at the Lycee Abane Ramdane in Algiers, I received my Baccalaureate in Mathematics and then went on to the University of Sciences and Technology of Algiers to pursue a Diplôme d’Études Supérieures (DES) in Physics. Immediately following my DES, I left our beloved country for Great Britain to pursue a D.Phil. in Physics at the University of Sussex. Upon completion of my Doctorate, I went back home and after two educationally and humanly rich years, I left for the United States to seek better chances to enrich my scientific knowledge and pursue my ideas. There, I initially worked as a postdoctoral researcher on multiphoton processes in atoms and small molecules with Professor Edward Eyler and was fortunate enough to secure a tenure track faculty position at Delaware State University. 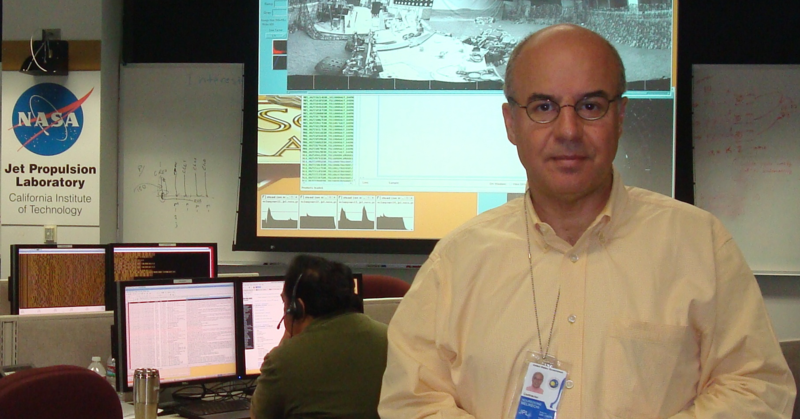 I moved up the various academic ranks before becoming Professor of Physics, the Founding Director of the Optical Science Center for Applied Research, a member of NASA’s Mars Science Laboratory mission (MSL) and the Dean of the College of Mathematics, Natural Sciences and Technology. I also hold the title of Visiting Professor of Physics at Vassar College, NY. IM: You are currently involved with NASA’s Curiosity Rover Mars mission, could you tell us more about this mission and what it aims to achieve? NM: The successful landing on August 5th of NASA’s Curiosity Rover on the planet Mars marks the beginning of a new era for space exploration. With the rover Curiosity, what we have today is a mobile laboratory on planet Mars. This laboratory contributes to our knowledge of the geochemistry of the red planet and provides data that helps in the assessment of its past and current potential for habitability. Curiosity is focused on finding scientific clues for habitability. It has four science objectives that can be summarized by the following: (1) Assess the biological potential of at least one target environment; (2) Characterize the geology of the rover’s field site at different spatial scales; (3) Investigate planetary processes of relevance to past habitability, and (4) Characterize the planet’s surface radiation, including galactic cosmic radiation, solar proton events, and secondary neutrons. To meet these objectives, the nearly 1-ton Curiosity rover relies on 10 research instruments operated remotely. Various evaluations can be performed with Curiosity, both during its descent and when on Mars. All of this is done in a very complex and to a large extent hostile environment: Mars has an atmosphere composed predominantly of carbon dioxide (95%), a surface atmospheric pressure about 1/100th that of Earth’s average and a surface temperature that varies much more than that on Earth: from – 128C during polar night to 27 C at equator during midday at closest point in orbit to sun. All of these conditions coupled with surface winds that can reach about 10 meters per second with gusts to about 40 meters per second make the red planet a tough place to perform many types of measurements. However, I am happy to let you know that the mission is progressing very well at the moment. IM: How does this mission relate to previous Mars missions and what impact is it expected to have on future missions? NM: Until 1965, with the successful Mars flyby mission, almost everything we knew about the red planet was based on observations made from Earth. For example, by analyzing the light from Mars, we learned that its atmosphere was dominated by carbon dioxide. What we learned and continue to learn from previous Mars missions and other NASA missions is key. For example, NASA’s Mars reconnaissance orbiter was used to explore more than 30 sites for the Mars Science Laboratory. This was done to examine specific details about the potential landing sites and to assess potential landing hazards down to the scale of individual rocks. This process was part of the overall selection process of Gale Crater as the landing site for the Curiosity rover. The Mars Science Laboratory mission is actually the largest ever space exploration mission. This is the first time a mobile rover with no less than 10 major scientific instruments is operational on Mars. So what we learn from this mission is bound to shape future Mars and other planetary missions in many regards: science, technology, innovation, management, outreach and education to name a few. IM: So, what is your exact involvement in this particular mission? NM: One of the ten instruments on board of the rover Curiosity is the Chemistry Camera. This instrument consists of a remote laser-induced breakdown spectroscopy (LIBS) setup and a remote micro-imager (RMI). The laser spectroscopic instrument currently on Mars provides data on Martian soils and rocks. Essentially, LIBS consists of focusing a laser pulse onto a target (in this case a Martian soil or a rock), which generates a plasma plume that emits light, which in turn is collected for analysis. As an atomic, molecular and optical physicist, my role is to analyze -in very close coordination with other MSL scientists- the Chemistry Camera data we receive from Curiosity. To complement and better fulfill our role, we have built, in my laboratory, a chamber that mimics the atmospheric conditions known to exist on Mars. This helps us conduct laser measurements under Mars conditions and enhances our understanding of the data sent by Curiosity. IM: What are the latest updates on the progress of the mission? When are you expecting to have enough data to start answering the questions pursued in this mission? And what are your predictions about this data? NM: We are learning more and more on the planet. It is a huge puzzle and every piece of the puzzle is not available yet. Therefore it is still early to provide definitive answers to the questions that the mission is exploring. Let me emphasize that even if the experiments were performed in one of the most sophisticated laboratory on Earth, the analysis will take time. For the first time we have recorded optical signatures from the laser-induced plasma that was generated on the surface of Mars. The data are of excellent quality and is bound to yield new knowledge about Martian rocks and soils as the analysis evolves. In addition, we know much more about the atmosphere of the red planet. For example, we now know, after only about 90 sols, within the limit of detection of an instrument called SAM, that methane was not detected. Clearly more measurements will be conducted to further explore this question. Another important update is that the soil samples that Curiosity has analyzed this far are consistent with the idea that at one point in time, the region explored was wet. As for predictions, we simply have to be patient and wait for rigorous analyses to advance further. Curiosity is already showing us that we have a lot of work to do to better understand the red planet. IM: Previous space missions were often accompanied by various controversies, particularly in relation to justifying the vast amount of spendings required to support such missions. Other large research programs, such as the current work on the Large Hadron Collider are also coming under similar pressures. What are your thoughts about this? And what is your take on why should these kinds of research programs be supported? NM: From a purely scientific point of view and if the resources were unlimited, one can argue that the creation of new knowledge, which often yields the development of new technologies coupled with the fact that these types of projects inspire thousands, possibly millions of young people, is enough. In addition, often these big science projects yield unexpected results that eventually are applied to enhance our quality of life. However, the reality is that funds are limited and as a result it is a question of priorities. Funding such projects requires a broad look at their societal and economical impact. As science is a discipline, which by its very nature is global, I believe that one way -may be even the best- to continue funding these large projects is through international collaborations as is the case for the Mars Science Laboratory. IM: In other lines of research, you are working on using laser technology to help with early detection of cancers. Could you tell us a little about this research, the technology used to support it and how it relates to the Mars mission? NM: This is my second line of research and as your questions implies correctly, it is related to the Mars Science Laboratory mission. Cancer is a very old disease that has a large burden on society, both in term of human lives, and of course in economic terms. The good news -if we can call it that- is that many cancers can be treated successfully if they are detected and diagnosed very early in their development. In my laboratory and in coordination with other researchers, we are working on complementary and synergistic approaches. The first consists of using pulsed lasers to generate spectroscopic data with enough sensitivity that, with the help of novel mathematical models, can differentiate between cancerous and non-cancerous samples. We have made the deliberate decision to work on blood samples not because it is easier but because if successful it is one of the most accessible biomedical samples available. Extracting blood does not require large and costly imaging instruments and nor does it require invasive surgery. How is this related to the Mars mission? Well, for MSL, a number of classification algorithms are being developed and tested for their performance in terms of differentiating and labeling various rocks and soils. This work is crucial for MSL but it can also be of huge importance for cancer detection, classification and eventually diagnosis. The dual application of an invention, or new knowledge learned, is certainly not a new concept but in this particular case it can yield unexpected and beautiful new technologies. The second approach we use in my laboratory consists of combining nanotechnology and laser spectroscopy -once again- to detect early signs of specific cancers in blood. 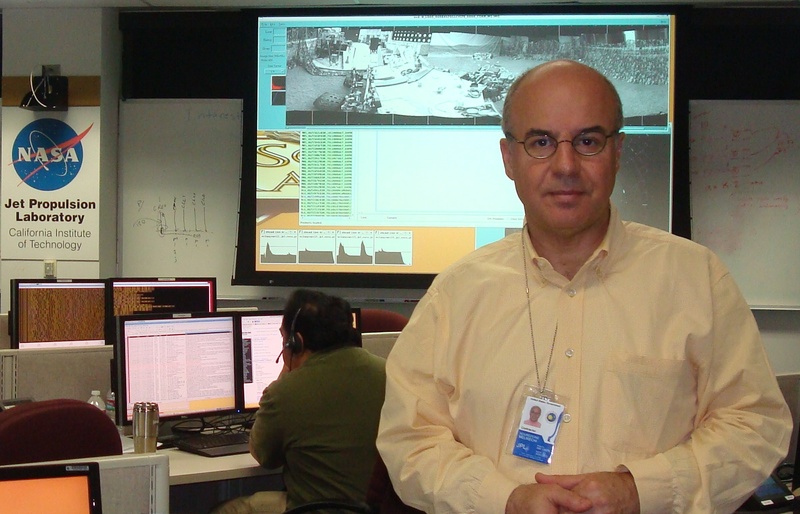 Dr. Noureddine Melikechi in the control room of Curiosity at NASA’s Jet Propulsion Laboratory, California Institute of Technology, a few days following the landing on Mars of Curiosity. IM: Inspire Magazine would like to congratulate you on receiving the Delaware Bio Award for Academic Research this year. Your leadership in the transfer of intellectual property to a technology company has also been acknowledged together with this award. What would you say are the key challenges to address in order to support innovation in the biotechnology sectors and to nurture fruitful collaborations between university research and industry? NM: Thank you for your kind comments. First, it is essential that the various players that have a stake in biotechnology work actively together. Together they can encourage the creation of new ideas and transform some of them into new high technology companies. With sustained effort, this will enhance our quality of life, create new high technology jobs, and eventually provide our universities with a new revenue funding pool. However, this requires the prior existence of many tools not least of which are excellent management, the protection of the intellectual property and the existence of incentives for all parties (inventor, investor, university,… , etc.). Second, we should be prepared to use “failure” as a lesson and to continue to create the ecosystem needed to eventually succeed. Third, we need to invest in the creation of private-public startup hubs that include academic institutions, create a network of mentoring and support, and nurture university and industry research collaboration. So, I think that somehow the different parties need to come to the conclusion that there is a real advantage in working collaboratively on well defined and designed projects. For this to have a chance of happening, one needs to promote the creation of collaboration networks, the secure exchange of information to identify promising research and development projects, and pre-agreed upon agreements that provide incentives. IM: Given its multidisciplinary and cross-disciplinary nature, where do you see the place of space research in Algeria? NM: I believe that a country as vast as ours and with the relatively rich human capital it has developed over the years can and should be able to develop an applied space program focused on better understanding our own country. We can envision exploring the development and use of space technology to image key areas of the country so that we can measure key indicators. These can and will enhance our agriculture and fishing productivity, help us fight desertification and better know our natural resources including those in regions that are not easily accessible. To do this, we can first identify a strategic application, then develop a road map for success and implement it once the goals and resources needed have been identified and secured. IM: What role, if any, should Algerian scientists who are based abroad play in the development and implementation of a robust national research strategy? NM: I think that we are well placed to play a critical role because 1) Algeria is our country, 2) we have gained an experience -collectively, a considerable one- outside of our country, 3) there is a desire from our counterparts in Algeria to have the Algerian scientists abroad be part of the development of the research culture, and 4) I believe there is a strong desire of the Algerian scientists abroad to contribute to this effort. In my view, it is very important to strengthen the bridges we have with our counterparts in Algeria. This will allow us to better understand the state of the research in Algeria. As for contributing to the development and implementation a robust national research strategy, this requires concerted and sustained efforts. May be we can create various mechanisms for debating this question transparently, broadly and without any precipitation. To be successful, a strategy will need resources -even during its development phase- and periodic independent evaluation. Each one of us needs to identify the best way he or she can help in this endeavor. It will be hard but that should not prevent us from attempting it. IM: In general, how do you think we can develop a stronger science culture in Algeria? NM: This is a very complex question that in my view requires a debate that includes many segments of society: scientists and technologists, academics with expertise in sociology, psychology, economics, business leaders, people interested in investing in knowledge based starts-ups, and of course decision takers. However, I think the following three points are important for such endeavor. First, develop -if of course it does not exist yet- a national research strategy that includes enhancing the science culture in Algeria. This includes identifying the long-term resources needed to accomplish the desired goals. Second, encourage our youngest minds. I am talking about the students who are today in middle and high schools, to learn to problem solve, innovate and create. Third, explore the idea of launching an academy of, or an institute for, the advancement of sciences and technology in Algeria. Such an institution should be an independent entity that acts as a think tank for the country. IM: What would your advice be to young Algerian researchers about how they can be at the forefront of science and conduct cutting edge research? NM: Three points: 1) They should believe in themselves even if the circumstances are not always ideal; 2) They should find what their passion is and nurture it; 3) They should ask questions, dig deeper, stay informed, and remain interested and even better engaged in science, mathematics and technology because these fields are likely to play a larger and larger role in many aspects of our lives. Do this while not ignoring other fields such as foreign languages and the arts because many key discoveries are made at the interplay of various fields. And on an individual level, grow as a person with strong scientific and cultural foundations. If anything my journey, and that of many other Algerian women and men, should be seen as an encouragement, not an exception. If I can do what I have done, there is absolutely no good reason why others cannot do better. There is another side though and that is: we, their elders and those with a little more experience, have to believe in them, inspire them, encourage them and help them get engaged in the pursuit of innovation and the creation of new knowledge. Algerian women and men who have succeeded in their own field of interest be it the sciences, mathematics, technology, the arts and humanities, etc., can be excellent inspirational figures. We can think of various mechanisms: for example, be part of a support and mentoring system that our youth can benefit from. Each of us may inspire differently our youth. We can promote critical thinking and quantitative reasoning and innovation. This will help better prepare our youth to compete globally for the jobs of tomorrow. We have already one huge asset and that is information. It is, by and large, readily available, often one click away. It will be even more so by the time they are ready to start their careers. By remaining focused on designing, planning and shaping their future, there is no reason why our youth will not succeed. Sure the trip is not going to be an easy one but it is certainly one worth taking. IM: Thank you very much again for your time, it has been a pleasure conducting this interview with you and we wish you all the best with your endeavours. NM: Thank you again for your initiative and for getting in touch with me. I hope that my modest scientific journey will inspire some young Algerians and look forward to the day when more and more Algerians get involved in whatever excites them and helps others. Of course, they can and will do well when encouraged and provided with the opportunity to be engaged in the development of our country. We are fortunate to have, within and outside of Algeria, a relatively large and diverse pool of excellent and experienced researchers and a large number of youngsters eager to succeed. Your magazine is one more example of what is possible to do to help. A great pride for all Algerians.